Slugs are molluscs like snails. But most do not have an external shell. Some slugs such as nudibranchs are among the prettiest of marine life. Slugs have very specialised diets and should not be kept in home aquariums. What are slugs? Sea slugs belong to Phylum Mollusca and Class Gastropoda. They look like naked snails, i.e., without shells. Sea slugs are of course those found in the sea. There are also slugs that live on land. Sea slugs may be generally differentiated into two main groups. Members of one group breathe with lungs. These include pulmonate sea slugs such as the Onch slugs of the Family Onchidiidae. Members of another group breathe with gills. These include the Opisthobranchs or just plain sea slugs. Bubble shell snails (Order Cephalaspidea). Where seen? You will be almost certain to see a sea slug on a visit to any of our shores. Onch slugs can be found among the rocks near the high water mark, while other slugs are found further down where it is almost always covered in water. Some are burrowing and many are found on or near their food. Some sea slugs are stunningly beautiful, among them, nudibranchs. 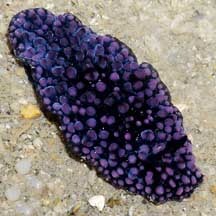 Features: Sea slugs range from large sea hares of 10cm to tiny nudibranchs 1cm or less. Sea slugs generally lack large external shells. Some many have external shells but cannot fully retract their bodies into these shells like other 'regular' snails do. Other sea slugs may have internal shells. Most sea slugs don't have any shells at all. Sometimes confused with flatworms. Here's more on how to tell slugs from flatworms, and how to tell apart the different kinds of slugs. Not softies: Although they lack shells, slugs are not helpless. Some taste bad, others release toxic or irritating substances. Yet others incorporate stingers of sea anemones, hydroids and other cnidarians that they feed on and use these to protect themselves. What do they eat?As a group, sea slugs eat a wide variety of plants and animals. But each species usually specialises in one kind of food. Human (ab)uses: Slugs do poorly in home aquariums because most have specialised diets (e.g., only specific species of sponges). Most eventually die a slow death from starvation. Some slugs may release highly toxic substances when stressed and may thus kill everything in the tank. Status and threats: None of our sea slugs are listed among the endangered animals of Singapore. However, like other creatures of the intertidal zone, they are affected by human activities such as reclamation and pollution. Trampling by careless visitors and over-collection can also have an impact on local populations. The Sea Slug Forum by Dr Bill Rudman: everything you could possibly want to know about nudibranchs with fabulous photos and close-ups of nudibranch body parts, larvae and more. And lots of links. The Slug Site has fact sheets with gorgeous photos of various slugs in the Branch of the Week collection. A Guide to Singapore Nudibranchs by Uma Sachidhanandam: though without any description of the nudibranchs, there are lots of photos and locations where the species are found and a list of Singapore nudibranchs. Tan Siong Kiat and Henrietta P. M. Woo, 2010. Preliminary Checklist of The Molluscs of Singapore (pdf), Raffles Museum of Biodiversity Research, National University of Singapore. Debelius, Helmut, 2001. Nudibranchs and Sea Snails: Indo-Pacific Field Guide IKAN-Unterwasserachiv, Frankfurt. 321 pp. Wells, Fred E. and Clayton W. Bryce. 2000. Slugs of Western Australia: A guide to the species from the Indian to West Pacific Oceans. Western Australian Museum. 184 pp. Coleman, Neville. 2001. 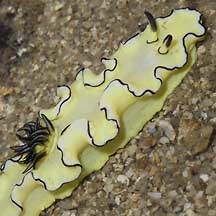 1001 Nudibranchs: Catalogue of Indo-Pacific Sea Slugs. Neville Coleman's Underwater Geographic Pty Ltd, Australia.144pp. Coleman, Neville, 1989. Nudibranchs of the South Pacific Vol 1. 64 pp. FREE photos of sea slugs. Make your own badge here.